The activities of PACE - Monmouth are organized and run by its Governing Body (GB). 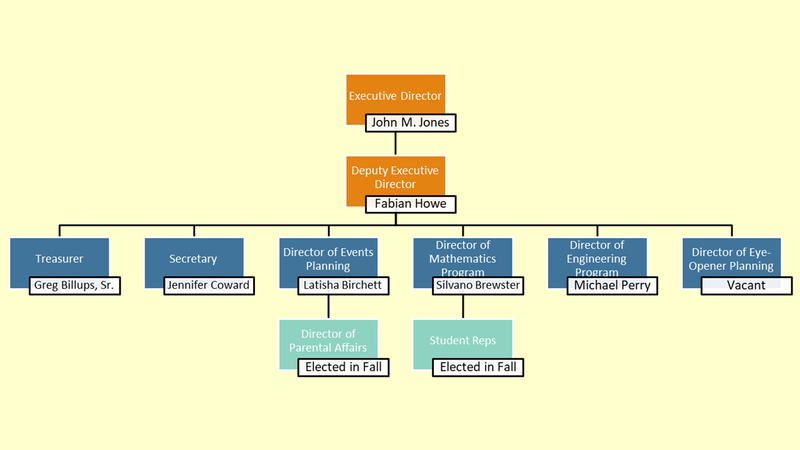 The Governing Body has the following members: Executive Director, Deputy Executive Director, Treasurer and Chief Financial Officer, Secretary, Director of Events Planning, Director of Eye-Opener Planning, Director of Math Program, Director of Engineering Program, Director of Parental Affairs, and Student Representatives. The Executive Director is elected to a two-year term. All the other GB members have one year terms. The terms run from July 1 through June 30. The Director of Parental Affairs is elected by the parents. The student reps are elected by the students. The remaining GB positions are elected by the staff. The GB org chart and member roles and responsibilities are below. Be responsible for due observance of the organizations Constitution and By-Laws. Establish program objectives and manage the progress towards their achievement. Review and approve budgets for projects funded by the organization. Serve as consultants for appropriate committees. Disseminate and clarify for the students, staff, and parents, the policies and procedures of the organization. Hold regular meetings with Governing and General Body to provide information, address issues, etc. Reserving rooms for meetings, special events, etc. Coordinates the activities of the parents and guardians of current student members. Coordinates the activities of the student members.